Heed Audio Obelisk si review | What Hi-Fi? 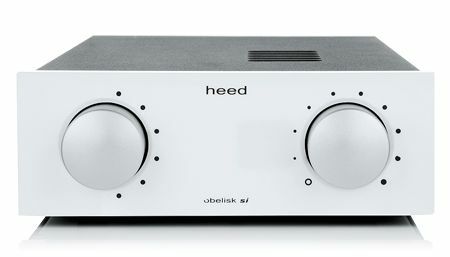 Heed Audio made its UK comeback at the Bristol Show in February 2012 (see video above), and here we have the first fruits of its labour in the form of the Heed Obelisk si amplifier. The Hungary-based hi-fi company is bringing the entire range of products carrying the Obelisk name back to the country from which they first emerged. The British electronics engineer responsible for the design of the original Obelisk amps was Richard Hay. Before he died, Richard was back at Heed Audio (in Cheltenham) assisting the company with new developments and UK distribution for both new and existing models. Hay said at the time: "The Obelisk has been a huge part of my life. It has lived in the capable hands of Heed Audio in Hungary, with whom I have had a very close relationship for many years, and I am thrilled to be able to bring the latest Heed products to music lovers in the UK." At first glance, the numbers for the Heed Obelisk si don’t look promising. Just 35-watts per channel in exchange for £1300 doesn’t appear particularly great value. Take this amp out of the box and things don’t look any sunnier. The Obelisk si feels solid, but it lacks the luxury feel we expect at this price. A credit card remote completes the unpromising first impression. Any doubts about this amplifier fade away once it’s plugged into a system. This is one of the most musically accomplished integrated amps we’ve heard anywhere near this price. Play something like Hey Mama by Black Eyed Peas and the Heed charges along, making the most of the intricate rhythms and dynamic thrust. This unit sounds robust and in charge even when pushed hard. And it’s enthusiastic without ever becoming overbearing. Move onto something more laid back, such as Emeli Sandé’s Mountains, and the amp shifts down the gears effortlessly. It delivers Sandé’s vocals with appealing body and subtlety. And it communicates the music’s message without diluting it in any way. The story is similarly positive whether your taste veers towards Tchaikovsky’s symphonies or the jazz of Bill Evans. However, compared with a beefier amp like the Rega Elicit-R, the Heed could do with more detail and greater dynamics. We love how smooth it sounds but it's a little hazy at the edges. And this Heed can be upgraded by an outboard power supply, the Obelisk X2 (£730), shown below. This raises output to 50W per channel and adds extra punch and scale to the proceedings. It can also accept optional modules: there’s a choice between a coax-only DAC (£265) or moving magnet phono stage (£145). We like this amp a lot, but there are better sounding amps. Regardless, it would be a mistake to overlook the quality found in this amp.